The 1073DPD combines two of Neve's world-famous Class A Neve 1073 microphone preamplifiers with flexible 192kHz digital output capabilities, for modern recording environments – all in a single rackspace. This classic design is the consummate mic pre for capturing vocals and musical instruments, with the added convenience of direct output to hard disk recorders or computers, thanks to the high-quality Neve-designed analogue-to-digital converters. For those who don’t already know its legacy, the big, punchy sound of the mic 1073 preamp complements any musical genre, from rock to pop, hip-hop to rap, thrash to classical. Its lush sound with classic Neve signature makes it the consummate mic pre for recording vocals, guitars, and all acoustic instruments. 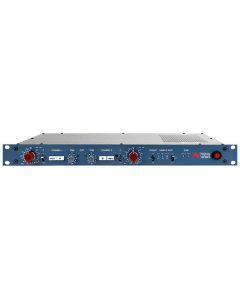 With the 1073DPD, two Neve 1073 mic preamplifiers are complemented by superb Neve-designed analogue-to-digital converters that can capture a performance in any required format. In addition to Neve’s famous Class A analogue, outputs are a series of digital options, including all standard PCM sampling rates up to 192kHz, selectable via convenient front-panel controls. A unique feature is the Neve DSD (Direct Stream Digital) output, providing unsurpassed quality beyond PCM technology. Despite its power, the 1073DPD is remarkably simple to operate. Two rear-panel Mic inputs and Line inputs feed dual Class A gain stages, with adjustable Gain control and selectable 48V available on the Mic inputs. Class A analogue outputs in XLR format are also found on the rear panel, controlled via adjustable front-panel ±10dB Trim controls. Analogue insert points are provided ahead of the A/D converters, ensure the classic Neve sound is retained. The combination of legendary analogue circuitry and superior digital quality makes the 1073DPD the obvious choice as a front-end for recording to digital workstations. The 1073DPA & DPD are supplied in a 1U, 19” rack-mounting unit.